Almost half of the work done by the contractor hired by the U.S. Navy to clean the heavily polluted former shipyard at Hunters Point in preparation for the city’s biggest redevelopment project in a century might have been either falsified or is questionable enough to require retesting, an initial review by contractors hired by the U.S. Navy has found. Contractors and workers with Tetra Tech, a Pasadena-based company with a long history of winning government contracts, were first found to have falsified soil samples in 2012, revelations that led the federal Environmental Protection Agency to halt transfers of shipyard land for development. More accusations of wrongdoing from former shipyard cleanup workers triggered the ensuing review of more than a decade’s worth of data produced by Tetra Tech. And of that data, more than 48 percent is “suspect” or has “evidence of potential data manipulation or falsification,” according to a series of draft reports compiled by a team of third-party contractors presented to the Navy and obtained by Curbed SF via a public records request. The findings are still in draft form and have not been publicly released. But they represent only the latest setback at the shipyard, where progress has largely been on hold since 2016, and they do not bode well for the future. This development is a vindication for neighborhood activists and environmental watchdogs, who have long claimed public safety and transparency have been sacrificed in order to speed the real-estate development along. A view of the shipyard from the open areas near the new townhomes and flats at The Shipyard SF. Home prices range from $775,000 for 740 square feet, and $1.5 million for a two-bedroom. It also casts serious doubt on San Francisco’s ability to meet its current goals for building badly needed market-rate and affordable housing. The transformation of the former San Francisco Naval Shipyard—home of a Cold War-era nuclear warfare research laboratory—is part of the largest redevelopment project in San Francisco since the 1906 earthquake, according to developer Five Point. Since the 1990s, at least $1 billion in taxpayer money has been spent in removing radioactive and industrial contamination from the area. As of 2014, Tetra Tech had been awarded contracts in excess of $300 million, NBC Bay Area reported. Spokespeople for the Navy and the real-estate developer at the San Francisco Shipyard, Five Point, declined to comment on the findings. 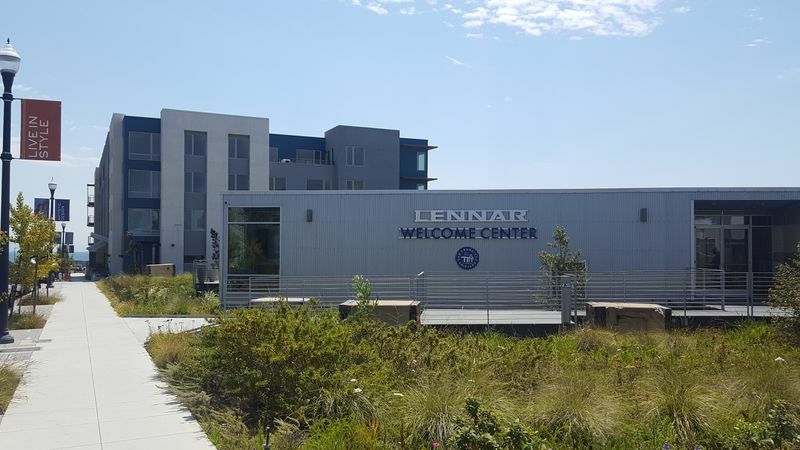 Five Point is closely associated with mega-developer Lennar, which negotiated with the city the development plan for the shipyard. Local elected officials, city bureaucrats, and Bayview-Hunters Point community members tasked with observing the cleanup would not comment. Environmental watchdogs have petitioned the federal government, asking for the contractor, Tetra Tech, to have its license to conduct such cleanup projects revoked. They are also repeating earlier calls for the cleanup to be held to a higher standard. “We are pleased and feeling vindicated that the government agencies that helped cover upthe radioactive scandal at the shipyard now seem to be admitting that the problem is greater than they ever admitted before,” said Bradley Angel, executive director of Greenaction, a nonprofit that’s been closely monitoring the cleanup since the 1990s. Areas of the former shipyard, including the most toxic sites, are also at risk of becoming inundated by the bay due to sea-level rise, observed Angel, whose group wants the cleanup held to a much higher standard. A privately owned drydock and boatyard taken over by the Navy during World War II, the shipyard has been responsible for major changes in the city’s demographic and economic makeup. The promise of wartime and Cold War-era jobs drew thousands of people to the southeastern corner of San Francisco, many of them black. When the Navy vacated the shipyard in 1974, thousands of middle-class, single-earner, union jobs vanished. By nearly every account, this caused an economic crisis from which the Bayview-Hunters Point neighborhood has never fully recovered. Demands to replace the shipyard with another source of jobs and opportunity began well before the last aircraft carriers and nuclear-powered submarines left. Transforming the more than 400 acres of docks, workshops, test-sites, and landfills into the hub of a new neighborhood with more than 2 million square feet of office space and more than 12,000 homes is a mammoth undertaking that has already spanned decades and attracted international attention—and investment. The project has proved high-profile enough to attract renown architect Sir David Adjaye, who designed the Smithsonian’s National Museum of African American History and Culture, to be its master designer. Homebuyers are praised as “visionaries” buying into a “bold” future, with the promise of bars, restaurants, and shopping where empty lots and forbidding, rusting industrial buildings stand today. Some of the area’s industrial heritage is incorporated into Adjaye’s design elements, but when selling The SF Shipyard, Lennar does not emphasize what made the naval shipyard such a vital military base: A nuclear warfare research lab, an endpoint for ships irradiated during hydrogen bomb tests, and a general waste dump in an era when radioactive material like radium was treated like common garbage. A view of an area where soil has been removed and tested for cleanup. Nearly half of areas like this at the shipyard show evidence of potential data manipulation or falsification, according to an initial review. This contamination was serious enough for the area to be listed in 1989 as an EPA Superfund site, the government’s official list of the country’s most toxic areas that pose a risk to the public. 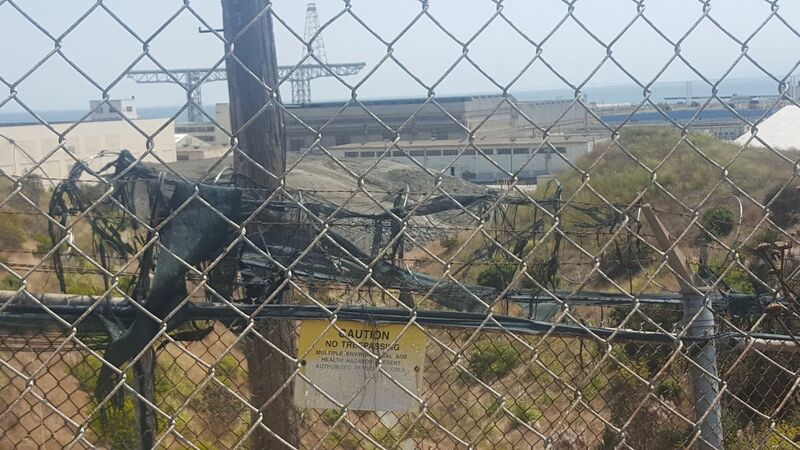 Fulfillment of the developers’ vision—and further transfer of former shipyard land from the Navy to Five Point—has been on pause since September 2016, after Tetra Tech, the firm contracted by the Navy to do the cleanup, was found to have faked at least part of its work. Following Tetra Tech’s admission of swapping soil samples, a $7,000 fine from the Nuclear Regulatory Commission that was waived on appeal, and a promise that all was well from the company, more former Tetra Tech workers and contractors once employed at the shipyard stepped forward in 2017 and alleged that fraud at the site was more organized and more widespread than the company admitted. Those revelations triggered a review of all of Tetra Tech’s data to date. 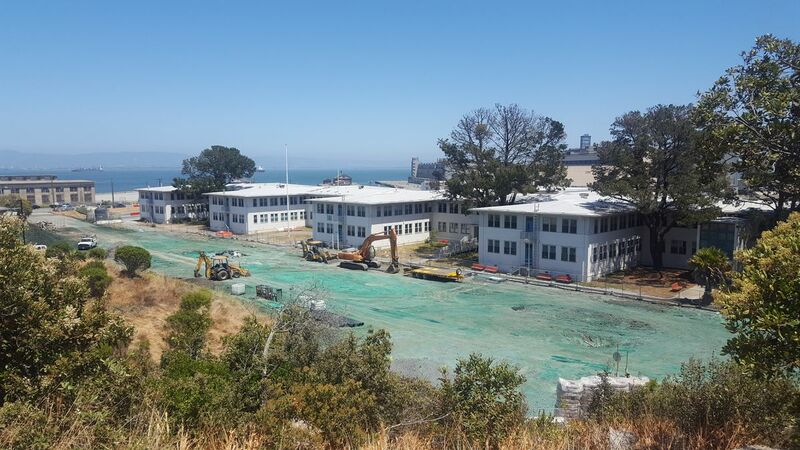 The ensuing review by third-party contractors hired by the Navy found almost half of Tetra Tech’s work dating back at least a decade is “suspect,” according to draft findings prepared for the Navy and obtained by Curbed SF via a public-records request. Out of 853 discrete tested “units” at the shipyard—lengths of trench, areas of soil, or buildings—414 were identified as “suspect” or showing “evidence of potential data manipulation or falsification,” and have been recommended for retesting, the draft report found. The findings do not apply to the areas of land already developed where people are currently housed. Those areas were used for base housing or other non-research, non-industrial activities, and have been declared safe by the EPA and the Navy. Michael Clinebell, a spokesman for Five Point, directed all inquiries to the Navy. In SEC filings, the company said that it could be until 2022 that all of the next 90 acres are transferred, “although it is possible that delays relating to environmental investigation and remediation could slow the remaining transfers” even further. In an e-mailed statement, a spokesman for the Navy declined to comment on the findings, calling them “incomplete” until “comments” from the federal, state, and local environmental agencies can be received. “The Navy must take this quality assurance step to ensure public confidence in the data evaluation process,” said Derek Robinson, the Navy’s environmental coordinator responsible for overseeing the cleanup. Findings are expected to be finalized and published ahead of a public meeting scheduled for January 31. 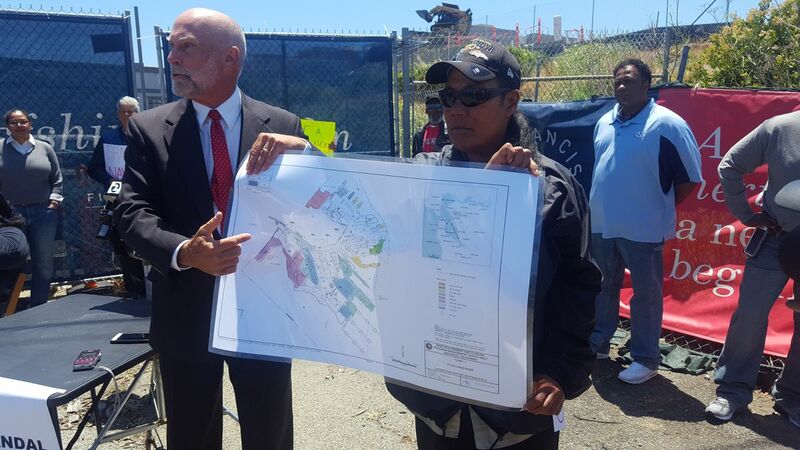 David Anton (left) points to a map of the shipyard at a June press conference announcing a petition asking the federal government to revoke Tetra Tech’s license to perform environmental cleanup. A later review prepared for the Navy found issue with nearly half of the work done by the company. The Navy also declined to estimate how much longer the cleanup would take or how much longer the project would be delayed in light of the years of work that must be redone—but, according to the draft findings, it could be many years. The work done by Tetra Tech deemed suspect was done over a period ranging from 2005 to 2016, according to the review. In addition to retesting the Tetra Tech work deemed suspect, the Navy will likely redo even more of the cleanup work presently considered clean out of an abundance of caution. “Because it is impossible to determine whether every instance of potential data manipulation or falsification has been identified, the Navy recommends additional surveys and sampling beyond the areas with evidence of data manipulation,” according to the draft report, authored by contractors Battelle, Cabrera Services, CH2M, Perma-Fix Environmental Services, and SC&A Environmental Services and Consulting, and reviewed by Oak Ridge Associated Universities and Argonne National Laboratory. The finding means a delay of at least another few years, and raise questions about the project’s long-term viability. But whether or not the project is scaled back, any delay seriously threatens the city’s ability to produce enough housing to keep up with demand, and also jeopardizes the city’s affordable housing goals. Having close to 40,000 units “entitled”, or approved by Planning, is extremely healthy for achieving the 30K goal. [...] It is important to note that just three projects, Hunter’s [sic] Point/Candlestick Redevelopment (10,500 units), Treasure Island ( 7,800 units) and Park Merced (5,860 units) represent over 60% of the entitled units. There are also 1,844 units of affordable housing planned for the site. For years, community and environmental activists have accused the Navy, its contractors, and various regulatory agencies—including the federal EPA and the state Department of Toxic Substances Control—of prioritizing real-estate development and speed over health and safety. “We always knew it was much worse than the Navy admitted,” said Steven Castleman, an attorney and associate law professor at Golden Gate University School of Law’s Environmental Law and Justice Clinic, and lead attorney in a petition filed with the NRC to revoke Tetra Tech’s license. Immense political pressure has been applied to the shipyard project, which involves some of San Francisco’s most powerful and influential figures. Sen. Dianne Feinstein and then-Mayor Gavin Newsom were the chief proponents of a 2008 voter initiative okaying the development project, with the promise that it would create “8,000 permanent jobs” and “up to 2,500 affordable homes.” It won by an almost 2-to-1 margin. Another competing ballot proposition that would have guaranteed 30 percent of the homes at the shipyard remain permanently affordable was opposed by Sen. Feinstein and Newsom. It failed. Shipyard backers have gone as far afield as China to lure investors to contribute the estimated $8 billion needed to develop the shipyard with the promise of EB-5 visas, in which entrepreneurs and investors can receive a green card in exchange for capital. Last summer, investors with Golden Gate Global, an EB-5 fund involved with the shipyard, were treated to a catered lunch at the park overlooking the shipyard. Investors munched on tacos and salsa from Nopalito, while a message from former Mayor Willie Brown thanking them for their business played on a big-screen television. The video made no mention of the clean-up’s many, ongoing problems, or the vestiges of the area’s toxic, radioactive past, including the buildings still deemed too unsafe for habitation, many of which are visible from the park. Initial results from the data review were presented to city officials and representatives from the developer Five Point last June, according to documents obtained by Curbed SF via a records request. 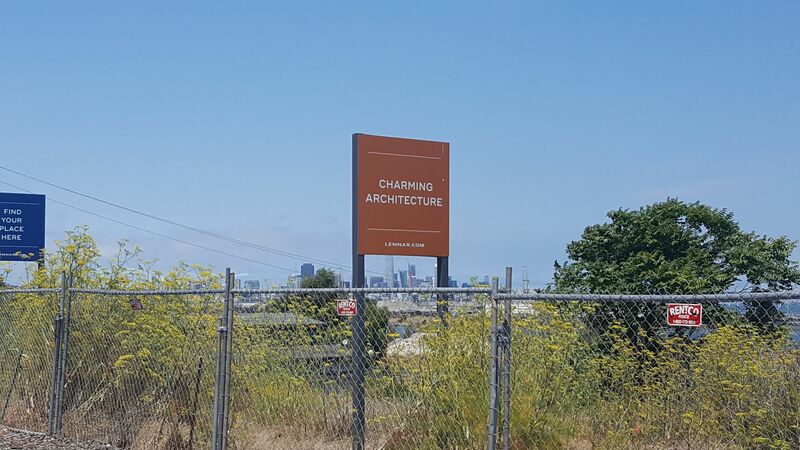 One of many advertisements for new homes available at The SF Shipyard. In the months since then, elected officials and city bureaucrats have proven reluctant to discuss the ongoing saga at the shipyard. An aide for Supervisor Malia Cohen, a Bayview native who represents the area, did not respond to requests for comment after Curbed SF shared documents detailing these findings. Deirdre Hussey, a spokesman for Acting Mayor London Breed who fulfilled the same role for the late Mayor Ed Lee, said the office would have no comment. Tamsen Drew, who oversees the shipyard for the Office of Community Investment and Infrastructure, a quasi-state agency that took over from the abolished Redevelopment Agency, did not respond to requests for comment. And Veronica Hunnicutt, a prominent figure in Bayview Hunters-Point who chairs the shipyard’s “citizens advisory committee,” an unpaid panel of community members to whom Navy and EPA officials occasionally report, also declined to comment. “I can tell you that we have been told that this matter is under investigation, and the Navy will respond to the Tetra Tech matter and to the CAC and other parties when their investigation is complete,” she said in an email. She did not respond when offered results from the investigation. The Navy and the various regulatory agencies are currently determining how much more retesting or additional work will be needed, said Kathryn Higley, the nuclear scientist from Oregon State University. In the meantime, officials with the EPA and other agencies have assured potential homebuyers, as well as worried workers at the nearby Candlestick State Park and from the San Francisco Police Department, which maintains an evidence warehouse at the shipyard, that the shipyard is safe and a wise investment, according to emails obtained by a public records request. Most of the radiation at the shipyard was in 28 miles of sewer and storm drains, down which various waste was dumped between the 1940s and 1974, when the Navy vacated the shipyard. Ships returning from the Pacific Ocean and Operation Crossroads, when the U.S. military tested the most powerful nuclear weapons in its arsenal at Bikini Atoll, docked at Hunters Point, where they were “cleaned” by sandblasting. Radioactive materials were frequently disposed of by dumping down the drains. From the 1940s until the late 1960s, the shipyard was the site of the Navy’s Radiological Defense Laboratory. Researchers injected animals with various doses of radiation, including uranium and plutonium, to ascertain the effects of exposure to nuclear weapons and resultant fallout on living things. The Navy believes there is a “possibility radioactive waste material” from those tests were also dumped down sinks and drains. The shipyard was also home to several waste dumps and scrap heaps, into which toxic or radioactive material like dials and gauges painted with glow-in-the-dark radium paint were unceremoniously tossed. In addition to cancer-causing radionuclides, there is toxic contamination from heavy metals, petroleum byproducts, paint thinner, pesticides, and polychlorinated biphenyls, a lubricant banned in 1979. Much of this waste will remain in place on-site, covered by a concrete cap and separated from the nearby bay tides by a concrete wall. Critics, including Greenaction, say contamination from the dumps has seeped into the bay, which will inundate the disposal sites in coming decades thanks to sea-level rise. By then, women living in Bayview Hunters Point were experiencing rates of breast and cervical cancer far higher than other parts of the city. There’s no shortage of health hazards in the neighborhood. Two freeways bisect the area, which contains most of the heavy industry left in San Francisco. Until a decade ago, PG&E operated a gas-fired power plant within a stone’s throw of housing. For purposes of cleanup and redevelopment, the shipyard has been divided into alphanumeric parcels. Strict rules govern what can be built on the most polluted areas of the shipyard. Some areas are off-limits to schools, hospitals, and other uses that might attract children or pregnant women. On others, residents are forbidden from digging in the soil or planting vegetable gardens. Still others—like the former landfill—are reserved for sporting fields, and can’t be used for housing or retail. On each parcel, the length of sewer or storm drains were divided into “trench units.” Dirt pulled from the trench units and used as backfill were designated as “fill units.” Each “unit” could contain hundreds of thousands of individual soil samples. The Navy first discovered alleged wrongdoing at Parcel C, the pier where ships returning from Operation Crossroads were docked. Here, the Navy found “significantly higher concentrations” of contaminants than initially reported by Tetra Tech. Out of a total of 200 trench units, fill units, and buildings sampled at Parcel C, there is “evidence of potential data manipulation or falsification” at 134 of them, according to the third-party review of Tetra Tech’s data. At Parcel E, where some of the Navy’s early radiological testing was conducted, and where the Navy later spilled a large amount of cesium, 104 of tested “units” have been recommended for retesting. On Parcel G, the ratio of verified clean samples to samples that need retesting is almost 40-60: 76 units recommended for retesting to 96 samples deemed clean. Significantly, in late 2016, even as evidence of fraud was mounting, the Navy argued that Parcel G should be cleared for residential use, not just use as retail or office space. And soil known to be dirty was blocked from being sent to the offsite lab for testing. Retesting will involve either a review of archived soil samples, a review of the data or methods, or—in most cases—another trip out to the shipyard to pull new soil samples and test them, according to the draft report. That may not be enough to satisfy some shipyard critics like Castleman and the watchdogs with Greenaction, who say that all of Tetra Tech’s work is suspect and must be redone in order for there to be public confidence in the cleanup, as well as a scientific foundation for the hard sell to the public of the shipyard as safe and clean. As recently as 2015, the shipyard was described in the San Francisco Chronicle as “once-toxic.” And Olson Lee, the director of the city’s office of housing, referred to the area as a “former Superfund site,” despite the shipyard still being listed on the EPA’s list of the country’s most toxic areas and growing evidence that it was still unknown if the shipyard was no longer toxic.